The Tesla Roadster – the perfect Elise? 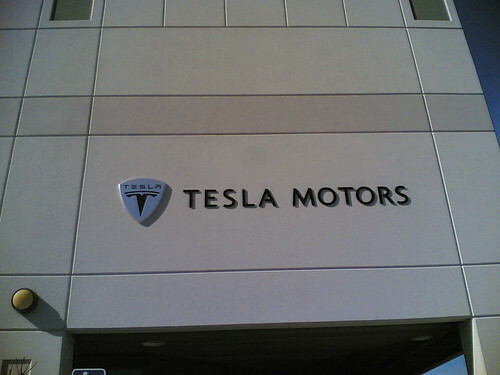 I had the opportunity to visit Tesla Motors on a tour organized by SFF1 and would like to write up some of my thoughts about the company, its technology and their first car. This is going to be from the point of view of a petrol head engineer who daily drives an Elise â€“ take it how you will :-). In case you havenâ€™t heard of Tesla, on account of the rock you have been living under for the last 6 months, it is a Bay Area automotive startup that is designing and building the Tesla Roadster which will be the worlds first mass produced electric sports car. I have been especially interested in the Tesla since it based on the Lotus Elise chassis and is in fact assembled by Lotus in Hethel in an arrangement similar to that used on the Opel Speedster/Vauxhall VX200. However unlike the Opel/Vauxhall, which were more like badge engineered Elises, the Tesla uses a substantially modified Elise chassis with an all-electric powertrain and is a whole new beast. I had already had my first look at the car during the Palo Alto British car meet but this tour was a chance to actually look at the car internals and to talk to some of the people behind this revolutionary machine. The most important piece of new technology in the car is of course its electric powertrain. Unlike established car companies which are have a â€œnot invented hereâ€ complex and prefer to develop their cars from scratch, Tesla followed a startup mentality and tried to source as much of the technology as they could. The most obvious example of this is in the way they created the battery pack for the car. 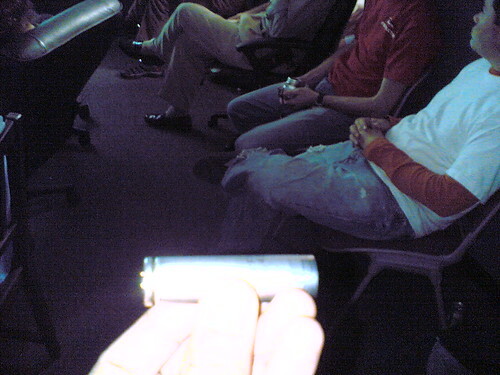 Instead of trying to come up with new battery technology, they instead sourced the fastest growing battery technology available today â€“ the Lithium Ion batteries used in notebook computers. 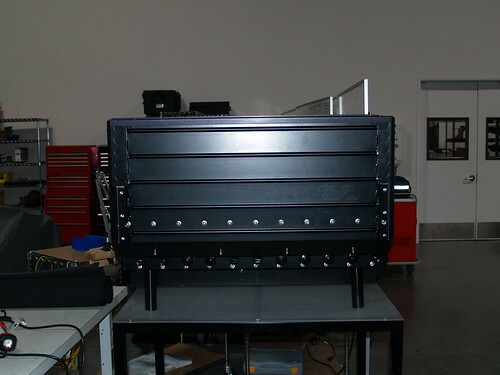 They use 6831 off-the shelf Li-Ion cells to form a 50 kW battery pack that provide the power for everything on the car. For those of you who are worried about exploding batteries – Tesla uses a lot more battery management technology including a heating/cooling system that keeps the batteries at their optimum operating temperature irrespective of the outside temperature. 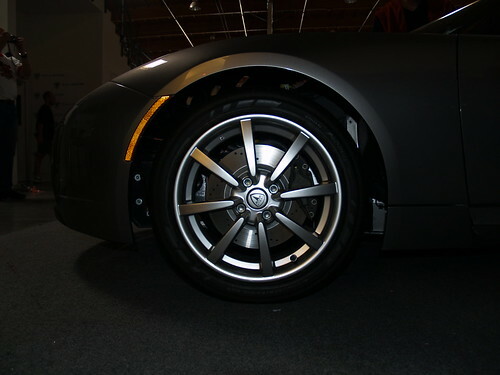 The electric motor spins up to 13,500 rpm and produces 248 bhp and 200 ft/lbs of torque while weighing just 125 lbs. The most startling thing about the torque is that you have maximum torque starting from 0 rpm all the way to 6000 rpm where it starts to slowly reduce. The entire powertrain has only 17 moving parts of which 15 are in the gearbox which is a clutchless 2 speed setup where 1st will take you to almost 70 while 2nd tops out at 130 mph. There is no reverse gear â€“ the motor (which has just 1 moving part, the rotor) just spins backwards when you want to reverse. 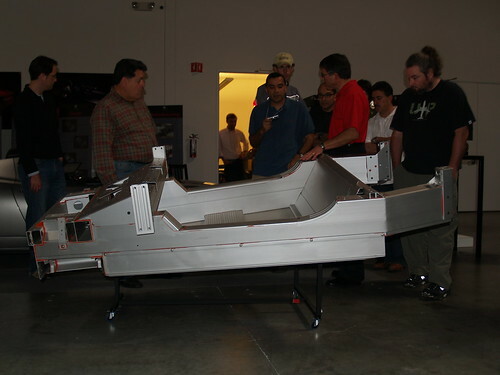 Following the technology sourcing mindset further, Tesla sourced the entire chassis from Lotus. By doing this they not only got one of the best handling chassis in the world but they also gained instant credibility by partnering with a 7 time F1 world champion constructor. The bonded aluminium chassis is a modified version of the Elise chassis and the front half looks to be identical to that of the Elise. The side sills have been lowered 50 mm to enable (relatively) easy ingress/egress which should make the Tesla more livable than the Elise. The rear subframe has been modified to hold the battery pack (900 lbs) and the motor (125 lbs) in the same position as the Elise engine to get similar handling characteristics. Following the Chapman philosophy of â€œsimplify and add lightnessâ€, Tesla has gone to great lengths to lower the weight and uses an all carbon fiber body to keep the weight down to 2500 lbs. The front suspension is identical to the base Elise except for the use of the AP Racing â€˜big brakeâ€™ kit to handle the added weight of the Tesla. 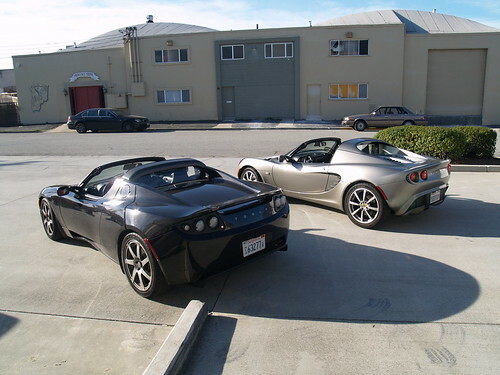 1) General livability: The Tesla beats the Elise hands down when it comes to general livability. Ingress/egress is a lot easier and the car comes with a lot more features like satnav and heated seats. The quietness of the electric motor will make it a lot less tiring to drive. 2) Performance: The massive torque of the Tesla means that you no longer have to wait for the second cam before being able to pass someone. Its handling will probably be not as pure as the Elise but I am confident that Tesla and Lotus will bring out a great handling car. 3) Urethane bumpers: The Tesla has urethane bumpers which should keep the car safer from braille parkers â€“ the Elise owners cracked clamshell nightmare should become a thing of the past. 5) Sticking it to Prius owners: You can tell the â€œholier than thouâ€ Prius owners to go screw themselves because their car is slow gas guzzling piece of crap. The Tesla is a near supercar that appeals to both car enthusiasts and environmentalists. 1) Price: ~$90k is a lot of money especially when you can get a Noble for the same money. The initial buyers will be buying the Tesla for electric car bragging rights just as much as its ability as a sports car. 3) Top speed of 130: The top speed of the Tesla is only a 130 miles an hour which prevents it from entering true performance car territory, but honestly how many people very actually get their car past 130 on the public roads? The better torque and passing ability of the Tesla should make it the more practical car on the street. 4) Looks: Informally talking to the people at the tour most people felt that the Elise looked a lot more exotic than the Elise. I think this was only an issue because the two cars were next to each other, the average lay person will still confuse the Tesla with a Ferrari. 5) No track days for you: The range of the Tesla really prevents you from tracking your car (unless you have your own private track in your back yard). One of the greatest selling points of the Elise/Exige is the ability to drive the car to a track, flog it for a few hours and then drive it back with now problems whatsoever. Since the my nearest track is over a 100 miles away this makes it a real deal breaker for me â€“ there is no way I can justify spending $90k on a performance car that I can never track. In conclusion I can say that the Tesla is more accessible to the general public and they will be selling them as fast as they can make them. It may not meet my needs in car but I will definitely recommend it to people who are looking for a fun second car with no track aspirations. It is an amazing car and real technological triumph – an electric car that can thrill you with absolute performance while still making you feel good about saving baby seals. For more pictures from the Tesla tour (including more pics with my Elise) visit my Flickr photo set. You know, I don’t necessarily see the lack of being able to track the Tesla as a downside. I see it as a business opportunity, especially in the southwest. Build a track for performance cars, and have a solar powered charging station for people to bring out their electric cars to track them. Could be a good business to get into since electric startup companies are popping up seemingly everyday. But I really enjoyed reading your write-up. The Tesla charges at about 80 miles/hour which means you could get to the track an hour or so early and hook up before your first session. Charging in between sessions should allow you to do significant track mileage as well. I agree the Elise looks more “exotic” than the Tesla (or just about any other car), but the Tesla’s styling has grown on me — it’s cleaner and less gargoyle-like. It looks less like a Hot Wheels car, and probably will appeal to more people on the whole. If you really wanted to track the Tesla, I suppose you could trailer it. When it comes to limited range, keep in mind that this is more of an infrastructure issue than something inherent to the car. Just imagine how different it would be if there were charging stations everywhere, but nobody had ever seen a gas station! Worth noting. . . With the portable charger it should be possible to charge the Tesla from a 50-amp RV hookup. RV parks have sprung up like weeds here in Texas. I might be tempted to take a long road trip just to prove it can be done. Obviously there would be some inconveniences, but nothing a pioneer spirit can’t overcome. Top speed: I’ve had my Esprit V8 up to 160 MPH. It’s sort of cool being able to say I’ve done that, but I definitely have no desire to do it again. 130 MPH is more than enough for the highway. Anywhere around 140+ is departing from the realm of sanity. PRICE is the one issue that nags at me. If it was the same price as an Elise, there would be no contest. It really depends on where you are coming from. For those who are into exotic cars, the Tesla could be a bargain — especially after you factor in maintenance and premium gas. For those who are *not* into exotic cars, and who already think the Elise is pricey (compared with, say, a Miata), the Tesla will be a hard sell indeed. 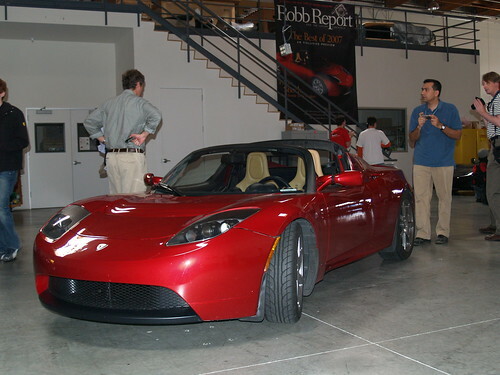 Pingback: Cars / Vehicles · The Tesla Roadster - the perfect Lotus Elise? Let’s see. You could BUY a big SUV and an enclosed trailer to take your TESLA to the track! But then, I think you might catch some flack back from those Prius owners you just dissed!